At Computex this afternoon, Intel formally announced its 3-series chipsets that were previously codenamed 'Bearlake'. We've already had a look at three different P35-based boards, which you can check out in our hardware section. We have already seen quite a few board designs based on Intel's replacement for the ageing 975X chipset, which is now officially known as X38. However, we haven't seen the chip packaging itself until today - it's a beast that comes complete with an integrated heatspreader and the pieces are starting to come together. 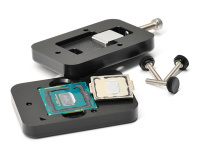 Firstly, when we saw Abit last week we learned that it opted against using a heatpipe cooling solution because it was insufficient for its requirements. Instead, the company's engineers opted for an active northbridge cooler that can dissipate up to 75W. Of course, we're talking about Abit's flagship overclocking board here, so we don't think that it'll use all of that power at its default speeds and voltages. Secondly, the IHS seems to lend itself to a chipset that's rather large because IHS' are often used to prevent cracking a chip's die. In fact, we managed to get hold of some die sizes to confirm this. The P35 northbridge, which doesn't use an IHS, has a 34mm² surface area and in comparison the X38's surface area is around 40mm², or 17.6 percent in relative terms.